Let see, what else has is new. There isn’t much really. Ian is still eating about every two hours and he would love to get his hands on more than four ounces at one serving. He did spend this past weekend with his grandmother – it was his first weekend away from mama and daddy. I can tell you I was excited to get him back this morning. When we first saw him, it took Ian a few seconds to see us, but once he did, he broke out in the biggest grin. We’re still waiting for the night that Ian sleeps through; he is still getting up about two times per night. He only got up once for mom over the weekend, so maybe he’s starting to sleep longer. I think that is all for now. I’m debating on whether I want to go check his weight. I do want to ask the nurses if there is a reason Ian is eating every two hours or if there is something I can do that will help space the feedings out a little more. I mean, geez, the kid is a little porker. :) But he is my porker. My little man is gone. As I type, Ian is spending his first weekend away from home; he is staying with his grandmother in Marshall; Ian will be gone the entire weekend – we don’t pick him up until Monday morning. What am I going to do with a full weekend without Ian around? It honestly took me at least a half an hour to let him leave with my mother. I know he is going to be alright, but he was put into a car that drove off without me. Call me hormonal if you want, but I did tear up. I started crying again when I got home and went into our bedroom and noticed the crib. It was 9pm and Ian wasn’t sleeping in it. He wasn’t in the apartment at all. 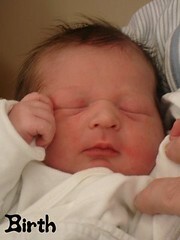 I have been with Ian every hour since he was born. That’s 3 months – or 13 weeks or 88.5 days or 2129 hours – of being constantly with him and now I’m expected to spend 72 hours without him. My arms feel empty. Okay, I’ll admit, I am being hormonal about this, but I haven’t been in an apartment where he wasn’t there as well. He has been attached to me for a year now (literally considering he was inside me for 9.5 months) and now that he isn’t here, it’s odd and kind of feels wrong. Not for any length of time, but he can hold his weight for a couple of seconds. 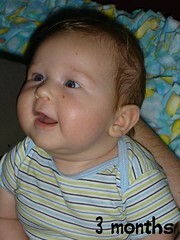 The digital camera is the bane of every infant…at least I think Ian is beginning to think so. It is no stretch of the imagination to say that we probably have a picture for every day that Ian has been born and since we have a digital camera, that is going to stay true. :) Not that there is anything wrong with that. Anyway, I just thought I would post some pictures of the many faces Ian has given us. Plus, here’s a video of Ian enjoying his bath. Don’t worry, there’s nothing he’ll be too embarrassed about. :P He is starting to get camera shy though. Thank you for contacting the Food and Nutrition Information Center. Regarding your question about gas and colic in your breastfeed infant, it is important that you see your pediatrician to rule out serious conditions such as an ear infection, hernia or GERD. If this has already been done there are several things that you can try. While breastfeeding, finish the milk in one breast before moving to the other breast, this may decrease the amount of gas in your son. When you eat high fiber foods which may cause gas for you, the fiber does not enter into the breast milk, so it shouldnâ€™t cause gas in your son. However, foods like cabbage, onions, broccoli, and garlic may cause gas for your son when you breastfeed. A food journal may help you identify the foods that cause gas and distress in your son. Colic is a little different. If your son is experiencing crying spells that last 3-4 hours at a time, you may try eliminating cowâ€™s milk from your diet for at least a week, especially if there is a history of food allergies in your family. Also, switching to formula feeding instead of breastfeeding has been shown to increase colicky behavior. Finishing the milk in one breast before switching to the other may also help with colic. The â€œsleep tightâ€ method developed by Dr. Karp may help you as well. Information regarding his method can be found at BabySlumber.com. I found this information in Breastfeeding: A Guide for the Medical Profession. Good sources on the Internet include the La Leche League and the American Academy of Pediatrics (AAP). The La Leche League can also help you find a lactation consultant if you continue to have problems. A good resource from the AAP is the New Motherâ€™s Guide to Breastfeeding by Joan Younger Meek, MD, MS, RD, IBCLC (International Board Certified Lactation Consultant). It’s not really a nutritional guide, but she did give me some other places to look. I’ve heard about La Leche League before, so I’m definitely going to check them out. Also, I’ve found that Hot Pockets are a very high source of gas for infants (I found out the hard way, so take note). I haven’t been able to find that Mother’s Guide to Breastfeeding at Barnes & Noble or Amazon, so if you do find it, let me know. So PJ/Trish received something at her baby shower that I thought was kind of cool. A friend of hers, Amy, gave her the recipe for homemade baby wipes. I never thought to make baby wipes by scratch. Either way, I just thought I would share the recipe. Cut full roll of paper towels in 1/2 and pull out the card board center. Place in plastic tub. Still oil & wash into boiling water & pour over paper towels. *The water is boiled to kill the germs to these wipes will stay fresh just as long as store bought. *You may adjust oil, wash, & water amounts slightly to your preference. *Variations – Lavender baby wash for soothing baby at night. Believe it or not, your baby’s newborn days are long gone. By the end of this month, he’ll have blossomed into a person with a mind of his own. He’ll be stronger, more independent, and wiser about the ways of the world. Learning at this stage happens often by accident. His little arms reach out and touch something. Maybe it’s a toy that moves or makes music. The next time he touches the same toy, he gets the same satisfying response. Pretty soon a light bulb goes off. He’s not trying to drive you crazy with “Pop Goes the Weasel.” He’s practicing his visual, cognitive, and motor skills. By doing it again. And again. And again. Happily, your baby will seem more coordinated in general this month. Especially when it comes to using his hands. Three-month-olds play with their hands as if they were toys. 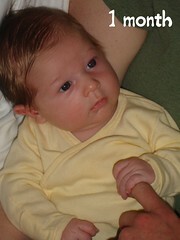 Watch as your baby stares in fascination at his fingers. He seems to know they’re pretty amazing tools. He’ll amuse himself playing with them. And he’ll move his fingers over the surface of objects, probing them for information about the nature of things. Can you believe your baby will have the hand-eye coordination to hold a rattle this month? Although for only a brief time. He’ll open his hand and grasp it using his palm and fingers. This is a palmar grasp. It’s like holding something while wearing a mitten. 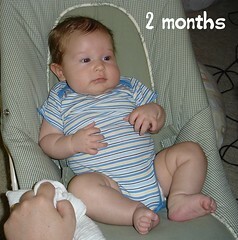 At about eight months, he’ll start to use his thumb, by placing it against the side of his first finger. Then, in a matter of weeks, he’ll be able to hold a piece of a cracker with the tips of his thumb and index finger. That is called a pincer grasp. Your baby will coo and smile spontaneously this month. He’ll probably cry less, too. And he’ll start expressing some new emotions. Making it clear when he’s interested and excited or bored and ready for a new activity. This is a fun time for Mom and Dad. Your little one is learning that you love and understand him. And he’s letting it show. Did you knowâ€¦that your baby’s brain will grow in “spurts” sometimes, just like his body? I finally have the nursery together the way I want/like it. Originally, Ian’s crib was going to be in the office. That’s kind of change. We had his dresser/changing table in our room and I wasn’t liking the idea that the crib and changing table were in two different rooms. That would make it so that Ian would be up longer at night if he needed changing, plus the office had the cat’s bathroom in it and it doesn’t always smell the greatest, if you know what I mean. So dad came up the other day and he helped me move the crib into our bedroom. This is what our bedroom looks with the addition of our nursery.